Prisoners are claiming an increasing amount of fraudulent tax refunds from behind bars. Just because they're already behind bars doesn't mean they aren't making out like bandits. Prisoner tax fraud has ballooned in recent years. In 2010, more than 91,000 inmate returns claimed $758 million in fraudulent refunds, a new audit from the Treasury Inspector General for Tax Administration finds. That's more than double the previous year. While the IRS stopped the vast majority of fraudulent refunds from actually getting into the hands of prisoners, $35 million still slipped through the cracks. "There is no limit to what the criminal mind is capable of," said Thomas Cooke, professor of accounting and business law at Georgetown University. "Identity theft is all too common today and filing a return with fraudulent data is all too easy." 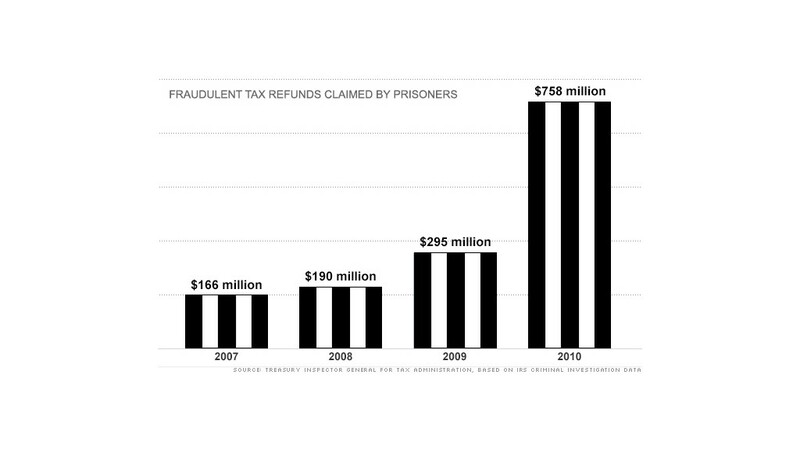 The number of fraudulent prisoner tax returns continued to increase in 2011 and 2012, although the IRS has yet to put a number on bogus refunds. Little to lose: Filing fake tax returns is a tempting way for prisoners to get some easy cash -- especially when they see how lucrative it has been for other inmates. "The information is easily available to these individuals, [and] the crime can be committed with limited materials," said Raul Vargas, fraud operations manager at IDentity Theft 911. Some prisoners use stolen identities, often from other inmates. Others use their own information but inflate their income and claim large amounts of tax withheld to cash in on big refunds. Since most prisons monitor inmate correspondences and flag outgoing prisoner tax documents for the IRS, inmates often get help from the outside -- presumably by offering a cut of whatever refund is received, according to an IRS presentation for the American Correctional Association Conference. Missouri inmate Kevin Dunham pleaded guilty last year to claiming $139,644 in fraudulent refunds for himself and his fellow prisoners -- $54,814 of which was received. Dunham prepared false tax returns for inmates using a typewriter and sent the returns to the inmates' families, who then mailed them to the IRS. Refunds were shared between those involved, and the roughly $200 to $300 cut Dunham received from each return was paid to his mother, who deposited some of it in his prison account. Another inmate pleaded guilty this week to filing seven fraudulent tax returns, claiming refunds totaling $3.5 million. He falsely reported that he had earned significant wages and had tax withheld from a nonexistent company called Safety Shoes & More, Inc. He received nearly $3 million from the IRS due to the scheme. Larry Levine, who served more than 10 years at a number of different federal prisons for charges that include securities fraud and narcotics trafficking, said inmates found annual reports in the library from big corporations that listed federal tax identification numbers and claimed they worked for them on 1040 forms. They picked companies big enough that they figured it would take the IRS a long time to verify their claims. The forms were then mailed to family members and forwarded along to the IRS, said Levine, who now provides litigation support to federal inmates through his company, Wall Street Prison Consultants. Other prisoners have claimed wages from companies that recently filed for bankruptcy, since these wages can be harder for the IRS to confirm, according to the Treasury inspector general. Some prisoner tax fraud has also been linked to organized crime rings that likely teach the prisoners how to commit these crimes before they're incarcerated, said Vargas. Stopping the fraud: One of the biggest challenges of stopping fraud is that not all prisoner refund claims can be automatically denied. Inmates who work within the prison, are on a work release program, earn investment income or worked for part of the year before being incarcerated are often legitimately owed refunds. To ensure that refunds aren't ending up in the wrong hands, TIGTA has previously suggested that the IRS wait to issue refunds until it receives third-party confirmation like W2s. TIGTA said the IRS could also stop more fraud by improving the accuracy of its Prisoner File -- which contains information like inmate names, wages and Social Security numbers that it collects from prisons. The inspector general found that about 500,000 of these files, or 18%, are potentially inaccurate or missing information. Not all prisons reported prisoners, some inmates were listed under prisons that have been closed, and other facilities reported having only one prisoner, TIGTA reported. The Federal Bureau of Prisons, however, said it regularly provides inmate data to the IRS to help it prevent fraud. 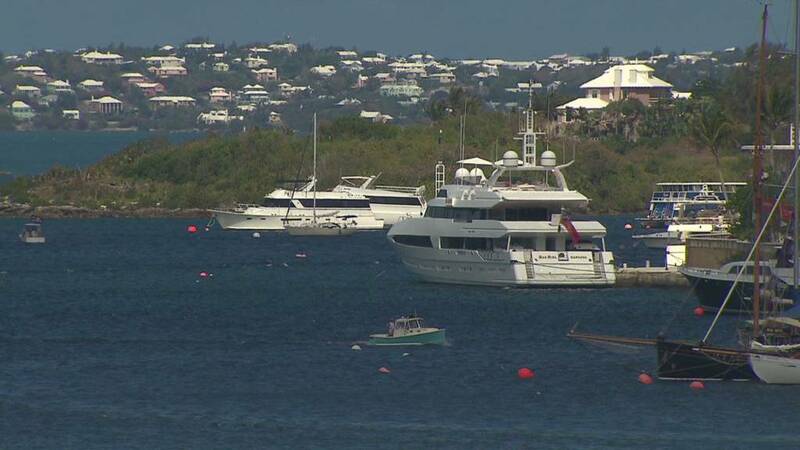 The IRS said collecting accurate data has been a challenge, but new laws are likely to help. "Tax refund fraud perpetrated by prisoners constitutes a serious threat to the integrity of the United States tax system, and the IRS is firmly committed to identifying and stopping it at the earliest possible opportunity," Peggy Bogadi, commissioner of the IRS Wage and Investment Division, wrote in a letter included in the report.